Welcome! 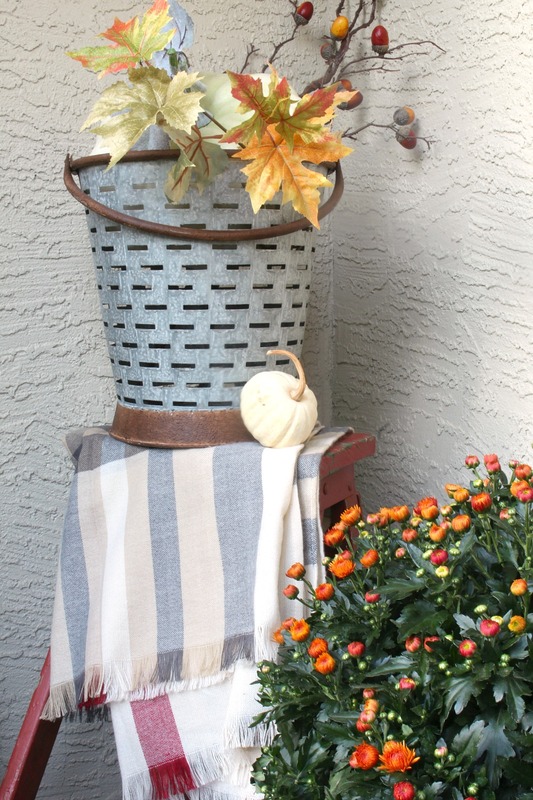 Today I’m moving outside with our fall home tour so put on those sweaters! 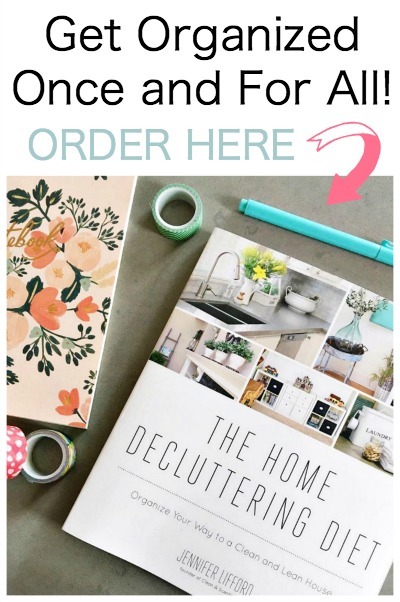 I’m joining Taryn from Taryn Whiteaker Designs and some of my favorite blogging friends to share our best fall porch decorating ideas. You can find all of the links and some sneak peeks at the end of the post. 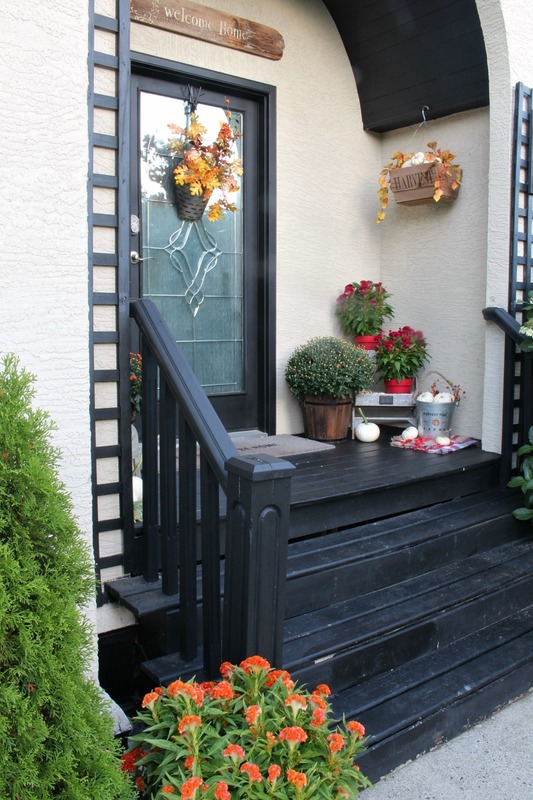 There are some beautiful porches – you won’t want to miss them! 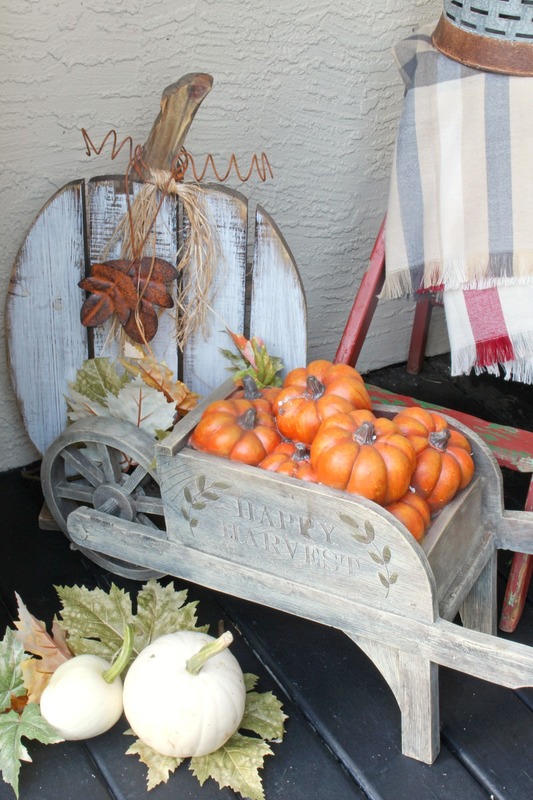 I always love decorating our front porch for each season. 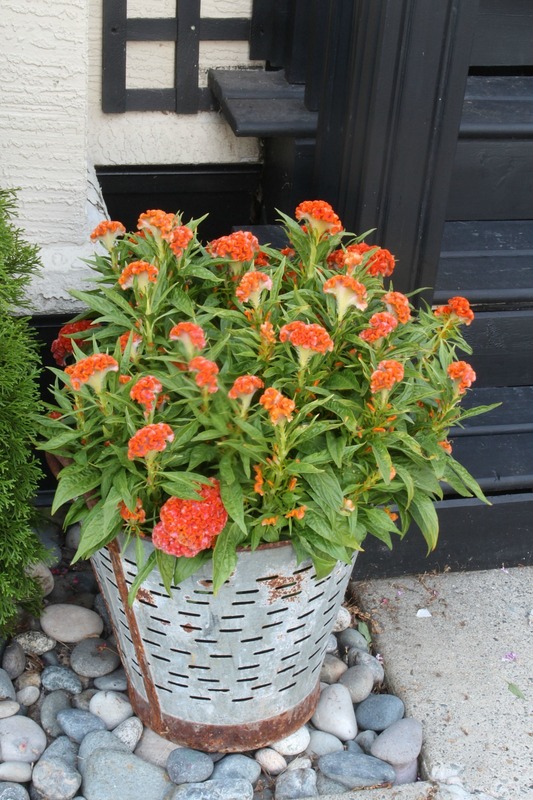 It makes coming home so calming and creates a welcoming entrance for guests. 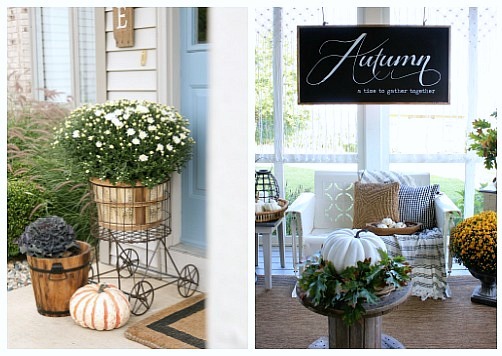 My initial plan for the front porch was to go more neutral with blue and white pumpkins – similar to our fall dining room color scheme. Unfortunately, I couldn’t find white mums ANYWHERE and the blue pumpkins were still not out at our local pumpkin patches. I think I was lucky to just find some white ones! So, instead of going neutral, I went the complete opposite and incorporated every fall color possible. Reds, oranges, yellows, browns and everything in between! When I went to the nursery to pick up some mums, I fell in love with these bright colored flowers. Of course, I’ve forgotten what they’re called although I’m pretty sure it started with a ‘c’. Let me know if you happen to know what they are! I haven’t had them before so I’m hoping they’re as low maintenance as the mums. 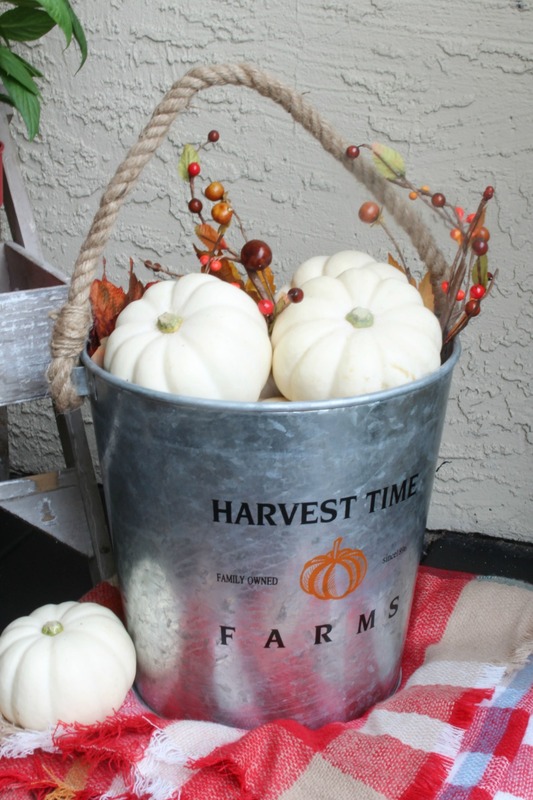 I did manage to find some small white pumpkins at one of our local farms and picked up a bunch of them to add to the hanging baskets and this Harvest Time bucket that I found at Home Sense. Since the bins were so deep, I stuffed the bottoms with crumpled newspaper and just topped them off with the pumpkins. I used a couple of my blanket scarves to add more color and texture to the space. I love plaid – especially with all of the different colors and the scarves are so cozy. If it gets too cold I might have to grab one of them back, but it’s not quite scarf weather around here yet. 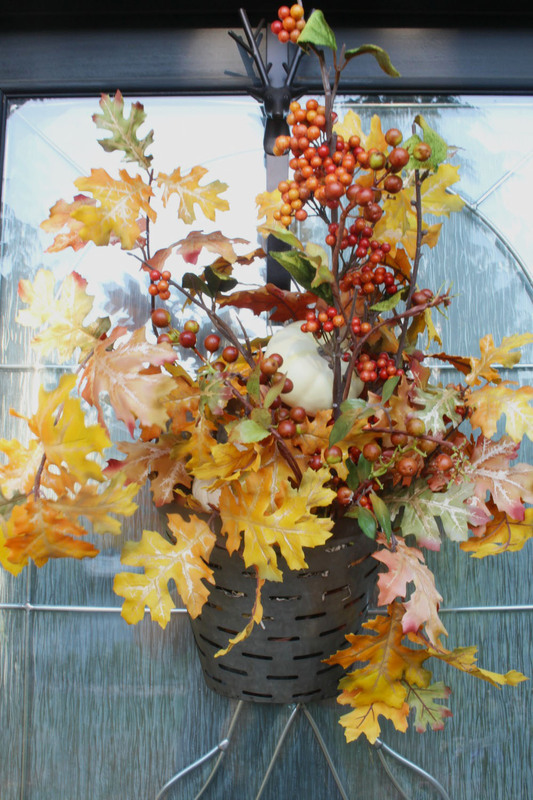 Our fall “wreath” ended up being a galvanized bucket filled with the remaining faux fall stems and berries. I had a couple of white pumpkins left over so I put them in as well. Thank-you so much for dropping in. 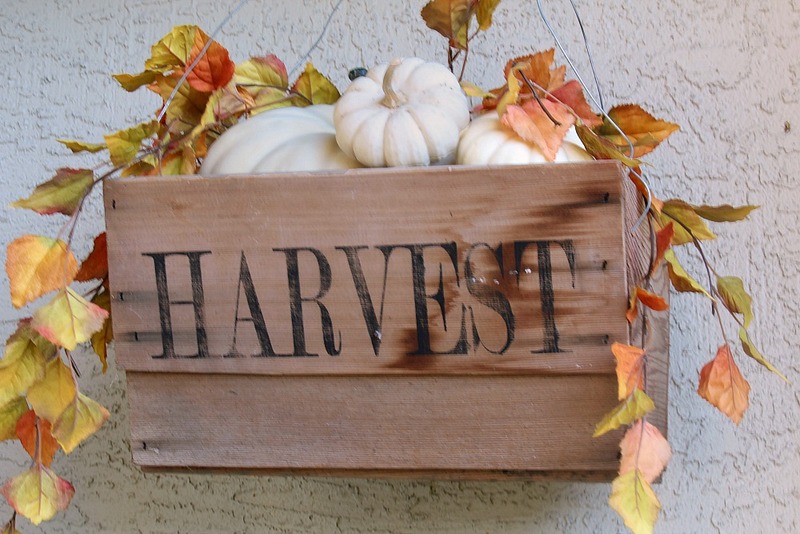 I’d love to hear what you’re up to for fall decorating! 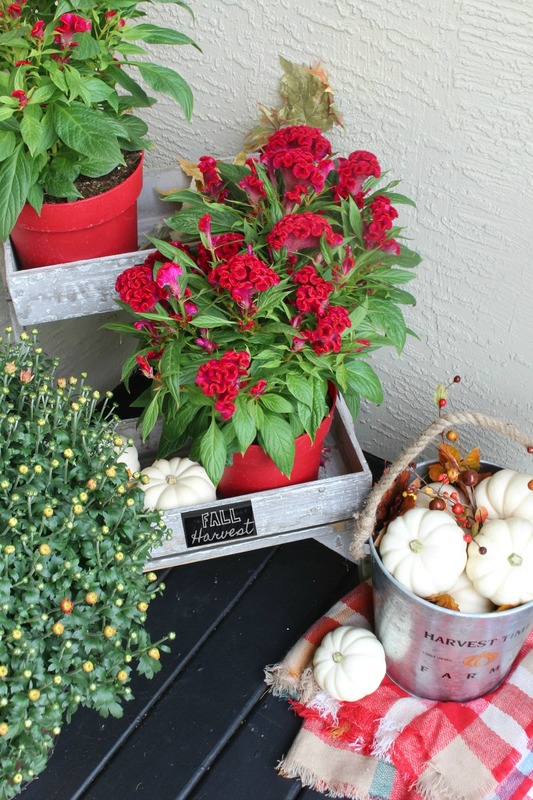 If you’re still not ready to get going, check out the posts below for even more fall porch decorating ideas. Well isn’t this a cute and colourful space! Well done, love it all. 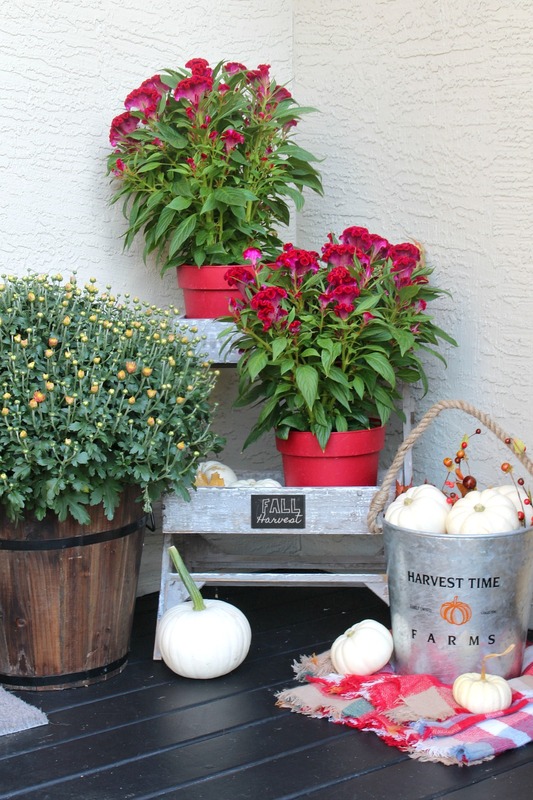 I’m totally in love with that fall bunch of goodness hanging on your front door. Everything looks beautiful and welcoming. What a pretty fall space! I had different colours in mine for my porch as well, but couldn’t find anything so I went with what I could find! I think you porch turned out perfect! Lovely and cute ideas and in the same time stylish and very colorful! I love them!